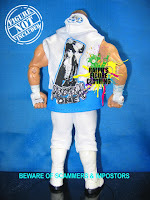 ShopTNA has a 1-of-3000 exclusive AJ Styles figure that includes a cloth version of AJ's entrance hoodie and an X-Division title belt. The accoutrements may be the reason you order this figure, because you certainly aren't paying $19.99 for the exciting paint deco. I'm sure AJ actually wore these tights, but he has much more exciting ring attire that would make for a more interesting figure. AJ Styles is the only TNA figure from JAKKS I own. I just can't get past the exaggerated physiques now that Mattel has introduced their properly scaled WWE figures. 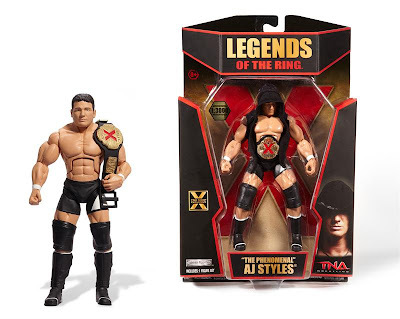 When JAKKS first announced their TNA acquisition, I assumed they would be utilizing the smaller, more articulated bodies they had developed for their UFC line. But nope, TNA got the hand-me-down treatment once again just like when ToyBiz handled the license a few years ago. If I was going to outfit my AJ Styles with a cloth hoodie, I would probably buy this one from Ralph for $13.99. I don't know exactly who Ralph is or how he makes such tiny clothing, but he is constantly updating his website with new outfits from wrestling's past and present. Nothing is too obscure for Ralph. He even has a tiny clown costume to transform your Hornswoggle figure into Dink. How many people even remember Dink? Most of the Doinks probably don't even remember Dink.